Anyone know when Middleton 7 oz cans were discontinued?? Hopefully this is the right place to post this question. If not, Mods, please move at your discretion. 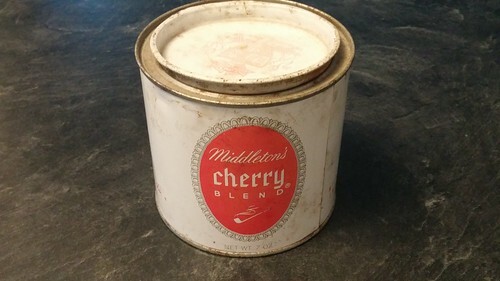 I acquired a vintage 7 oz tin of Middleton's Cherry Blend some time ago and have just moved the contents to a mason jar. I'd like to try to identify a production era if I could. 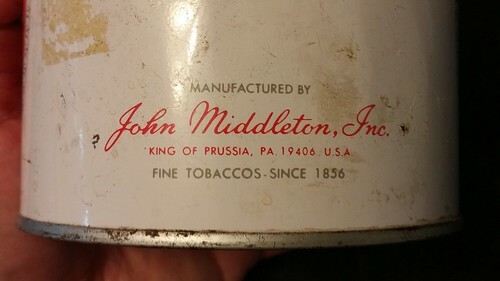 The tin lists the company address as King of Prussia, PA, which I know through research the company occupied in 1960. So potentially I've got some 56 year old baccy here. I'd like to put a date at the other end of the timeline. Middleton doesn't tin Cherry Blend anymore. If I can find the year the tins were discontinued I'd know the latest year this batch could have been produced. Anyone up on their Codger blend history? The baccy, by the way, was crispy dry but otherwise unaffected by its long stay in the tin. I rehydrated it slowly overnight last night and jarred it up this morning. I'll let it sit for a few days before sampling. Apart from guys like Jiminks, one who might be up on these could be Hufflepuff since he has experience with very old codger blends. However, he's undergoing some personal issues right now that command his full attention. And perhaps ftrplp, AJ, and a few others who have been at the pipe for a long time. Funny you mentioned Monbla is MIA. I've also noticed AJ has fallen off the planet..... No response to PM's for a few days now. Middleton discontinued a number of their blends between late 2005 and early 2007. There has been some dispute as to exactly when each blend last was tinned, but that 16 month period seems to fall between the suggestions. I don't know if this was one of those blends or not. I haven't seen those seven-ounce cans since the late '60s, possibly early '70s. I'm not saying that's when they were discontinued, but even back then they were kind of rare. They had the flip-key lid, right?--or whatever it's called. Seems like that might date them. Mixture No. 79 was the most often seen in my part of the tobaccosphere. Ontariopiper, if you have pics of the tin that would be a great deal of help. If pics aren't possible, just look for a SKU. If there isn't one its from before approximately 1973-5. Some companies were slow to adopt the SKU but as I recall all had by the mid 70's. Sorry guys but I've been dealing with my back problem and the Neuropathy in my hands sometimes flares up and makes typing too painful. I spoke with Michael on the phone today and he is still with us. He had a new air conditioner installed today and now hopefully he will be able to spend a little time in the room where his computer sits. He said it was up to 98 degrees in there before he added the new unit. He was cheerful and upbeat and plans to be posting again. Thanks, Jim! That's great info. No SKU on this one, so it's an earlier tub, circa 1960-1975. Here are a few picks. Great find! I never thought I'd find a use for knowing when they started bar coding products was but it's helped me date more than a few tins over the years. For what it's worth, the ZIP code indicates post-July 1, 1963. That's not a cardboard "tin can" is it? I could swear the ones I'm familiar with were all steel--so I will: &%#@!!! Most of the cans I've picked up over the years from this period were missing the flipper. Not sure why but folk seem to like prying them off.